Ideal for your necklace or lapel. Offering a size that won't go unnoticed. 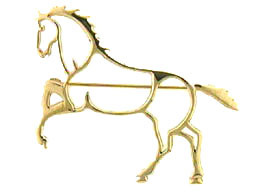 Check out this horse pin, it would look great on any lapel in the show ring. Have the mane and tail rhodium plated for a unique two toned design.